Bagna Cauda Dipping Sauce | Simple. Tasty. Good. 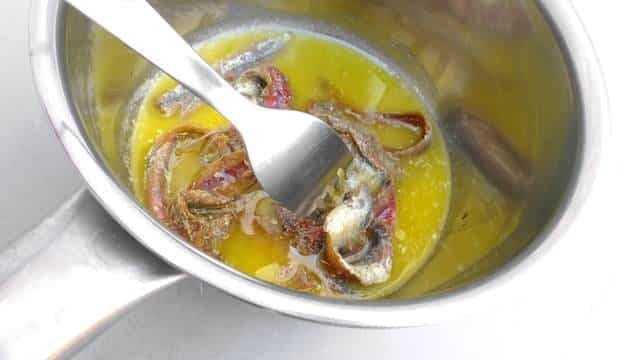 Bagna cauda… if you have ever been to Nice before then you certainly must have run into this delicious anchovy and garlic dipping sauce somewhere! But this is not the only spot where you can find it. This recipe originally comes from Piedmont in Italy and literally means something close to ‘hot bath’ or hot sauce. 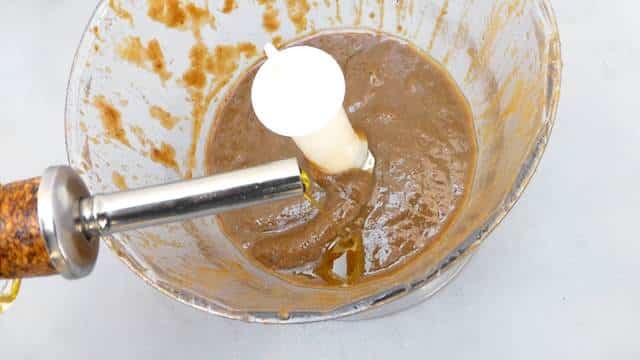 Think of it as a fondue: this sauce can be placed in the middle of the table in a ceramic bowl with a flame under it to keep it warm. I also like to serve it cold as a surprising appetizer dipping sauce. Add whatever raw, blanched or boiled vegetables you like: carrots, cauliflower, green beans, radishes, celery stalks, mushrooms, fennel, tomatoes, boiled potatoes… because vegetables are a great match for this salty dip! Enjoy this southern delicacy! Love canned anchovies? Then also check out another appetizer bite: my caramelized onion pizza with anchovies and black olives, a classic French pissaladiere! 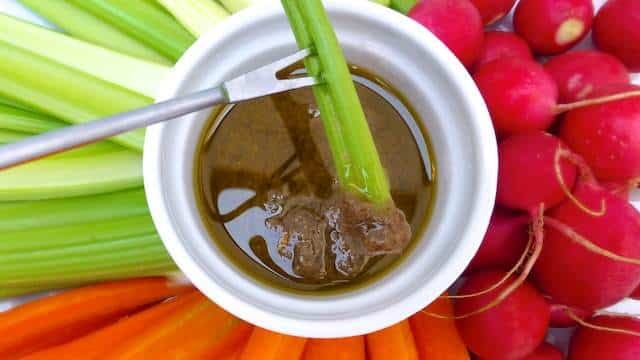 Look at this bagna cauda, a delicious garlic, butter and anchovy dipping sauce for raw vegetables... What a surprising appetizer! Don't peel the garlic bulb or tear it apart. Leave it in one piece but chop off the tops using a sharp knife. Don't exaggerate, this will only make it easier to squeeze the soft cloves out later. 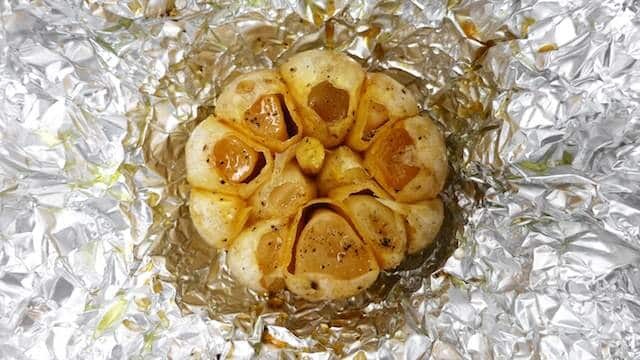 Place the garlic bulb on a piece of tinfoil and sprinkle with a little olive oil, pepper and salt. 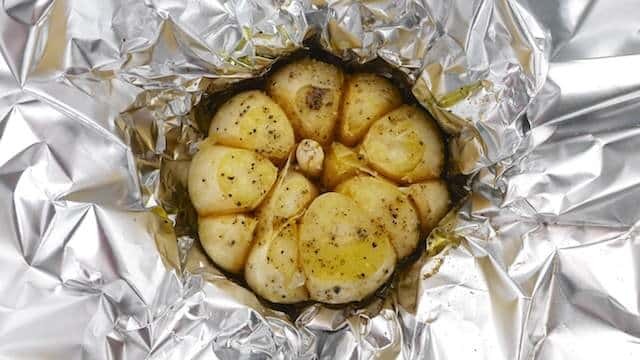 Then wrap the garlic bulb up entirely and place it on an oven rack in a preheated oven at 400 F° (200°C) for 30 minutes until the cloves are soft and mushy. Remove the garlic bulb from the oven and put it aside until cooled down fully. In the meantime add the butter to a small saucepan and place it over medium heat until the butter has melted. Then add the anchovy fillets and a little dash of pepper. Stir well and let the anchovy melt gently for a couple of minutes. Squeeze the soft garlic out of their pockets and add them to the anchovy butter as well. Stir well and take the pan off the heat. 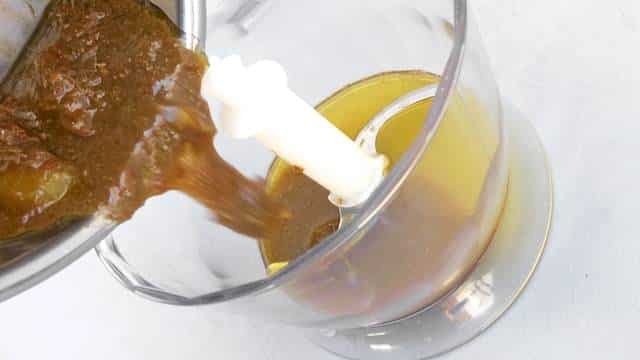 Pour the buttery mixture in a clean blender. Pulse into a fine mixture. 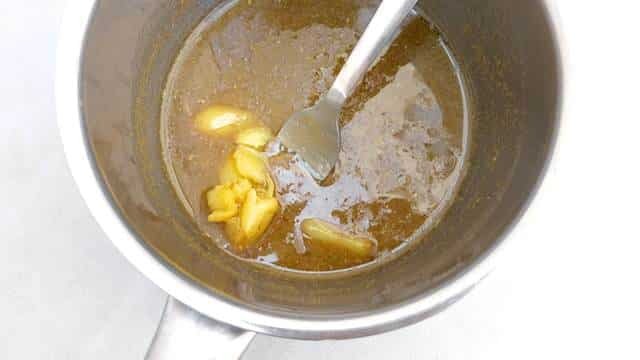 Then gradually add the olive oil until the mixture starts to thicken nicely. It shouldn't be too runny. Pour the anchovy dipping sauce in a clean bowl and serve at room temperature accompanied by some vegetables of your choice.